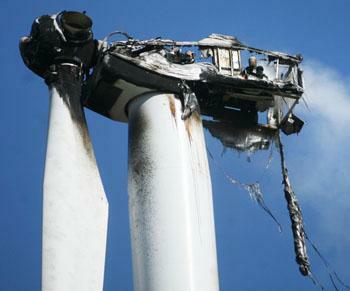 A wind turbine south of Garner burned Wednesday morning causing two of the blades to fall off. The incident was reported shortly after 8 a.m., a Hancock County Sheriff’s dispatcher said. A third blade was left hanging straight down. The fire occurred in the turbine’s motor housing. The motor housing was still smoking at 10:30 a.m. The sheriff’s office and Garner Fire Department were at the scene. The turbine was in a field with several other turbines. The turbines, part of an extensive wind farm in Hancock County, are owned by FPL Energy LLC of Juno Beach, Fla. They went into operation in 2002.